How To Manually Follow Focus. In a time before your camera did everything bar press the shutter button, lenses were manually focussed. This meant an actual human being had to look through a little viewfinder and focus on the subject without the help of any digital trickery. Having a sports photography background that stretches back to when manual focus was the only focus, I had to have the skills needed to nail the focus of a footballer running at me with the ball and the opposing player next to him trying to get the ball back. Framing the shot, hitting the shutter at the perfect time and focussing too is a lot to think about all at once so the focus actions became instinctive. Not every shot was sharp but there was always enough to keep the client happy. Today it’s still the job of a sports photographer to deliver sharp images to their clients but auto-focus, although not infallible, now ensures most images are sharp even when the subject is running, jumping or driving past the photographer. So why bother learning how to manually follow-focus? As everything has gone to auto-focus (AF), there are a lot of second-hand manually focussed lenses on the market and compared to new AF lenses, they’re going for bargain prices. Some are so old they don’t even offer auto-exposure settings so everything becomes manual but if a budget is what you have to work to, this can offer a lot of lens power for not much money. The photographer just has to learn how to keep that focus sharp. Also as a filmmaker I find myself having to call upon my manual focus skills as AF and filmmaking just don’t seem to work well together. Tracking a moving object in a frame that must be constantly in focus is a challenge to an AF system. It’s got to be 100% in focus throughout the shot or it’s ruined by the AF losing focus and searching to find it again. By learning how to focus manually the camera operator is in complete control of where the focus should be. Some shots demand focus pull, where the subject may start out of focus, then my manually adjusting the focus, the subject is brought back in to sharp focus. Not something that’s possible with AF. 1. 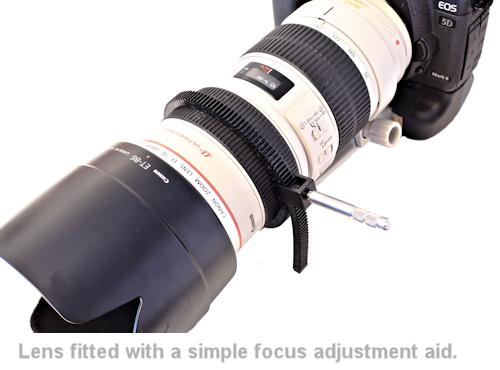 Does your camera have a dioptre adjustment on the viewfinder? If that isn’t adjusted to your eye you won’t see when the subject is truly sharp. 2. Do you need to make any setting changes on the camera for manual focus? 3. Some cameras allow you to change the focus screen to one that might suit you better, giving you a clearer focus-in-out view. 1. Check if the lens has any AF/MF switch. Adjust that accordingly. 2. Become familiar with the focus ring. Identify in which direction you have to move it to bring far-away subjects into focus and then moving it as they move towards you. One direction will head towards infinity and in the other, it’s closest focus distance. Somewhere in the middle of those two end-points will be your most used focus points. Knowing the direction to move the focus ring is one of the corner-stones of mastering follow-focus. 3. If the focus ring is stiff or sticky, manual focus is going to be tricky. Movement needs to be smooth,loose and fluid. Don't go spraying anything in that lens though. If the action isn't smooth, seek the help of an expert who knows how to service a lens. 1. Now your camera is ready and you know which way you have to move the focus ring, lets look at setting up the human part of the process. First, we’ll assume this is to shoot a photograph and not filming, that comes later. How you hold the focus ring is very important. It must be comfortable and relaxed so the photographer can operate the focus ring in small adjustments with ease. If you’re using a big, heavy lens perhaps a monopod or tripod is needed to take the weight. I use my thumb diagonally across the lens from my first two or three fingers to control focus with light pressure, with my hand under the lens. This is the most natural position. I wouldn’t recommend having your hand above the lens as that’s just too awkward. Once you are set up, you can look through the viewfinder. You have to find the focus first. It can be quite tricky to identify when something is actually sharp, so I like to move the lens completely out of focus first then bring it back in. Once your subject is sharp, the follow-focus can begin. Let’s assume you’re shooting a footballer running around a pitch, perhaps the most extreme example but the principles apply to any tracking you need to do. If the player is moving towards you, there is only one way the focus ring has to move, in the direction of closest focus. Remember how you learnt in what focus-ring direction this is? When that player is some distance away, as they move towards you the amount you move the ring is very small. Bigger movements will be required as they get closer to you. This is another corner-stone of the skill, seeing the subject moving, identifying in what direction and controlling the ring in the right direction with the exact amount of adjustment. Your eye has to see the subject moving out of focus and this has to pass to your hand to adjust the focus accordingly. If you feel focus has been lost, you can quickly pull completely out of again and bring it back. With practice you can adjust the focus without waiting for the subject to move out of focus. This is perhaps the greatest follow-focus skill you can gain as your subject is always in focus. This is akin to being a human follow-focus! The actual amount you have to move the focus ring to retain focus is likely to be quite small and as you practice you’ll appreciate how much movement you need to use in most cases. If you wanted to keep your football player in shot at full length, the focus ring won’t move that much from where you started the track to where you finished. (Of course this depends very much on where you started. You might have started when the player was a dot on the horizon and the lens was on infinity). Perhaps the hardest follow-focus environment is shooting live action because the subject has to be in focus for long periods, not just for the fraction of the second that you take a photograph. All of the above techniques apply, you just have to learn how not to lose focus whilst you’re filming. It’s always going to be the most valuable bit of footage you need the most that’s out of focus! If you’re filming where you control the scene, with actors for instance, you know from where they start and to where they finish so now you can nail the starting focus and finishing focus. Film crews sometimes use a person called a focus puller who’s job it is to adjust the focus of the lens. They work out the distances in the scene and mark the lens barrel to identify the adjustment start and finish points. These marks are made with tape or a non-permanent marker so they are easily removed. When the scene rolls, they watch the movement, adjusting the lens to those pre-determined marks. They don’t look through the camera, they watch the scene by the lens. The cameraman frames the shot. Even when you’re looking at the scene through the camera, it’s possible to use this technique of marking the start and end points in the scene by knowing where the focus ring starts at the beginning of the scene and in what direction to move it to where it will end, you can track your subject and adjust the lens whilst watching through the viewfinder. 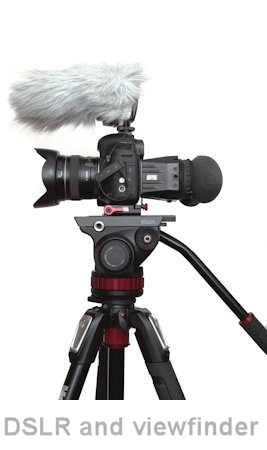 Filming with a DSLR brings new challenges because of how they record the footage. When you shoot a photo you look through the viewfinder but with video you have to frame and focus on the screen on the back. Achieving focus in this way is hard because there's no way to see the fine detail. Some models offer a zoom function that enlarge the scene to precisely adjust focus before you start to film. There are also after-market viewfinders which fit on to the back of the camera which you look through as though it were a viewfinder. These enlarge the screen thus aiding focus and framing. They also help when out shooting in bright light as they completely shield the screen. another useful accessory are remote electronic viewfinders that connect to the camera allowing the operator to see the scene without having to have the camera to their eye. It can be anywhere, on the shoulder, at waist height, on the floor or anywhere as long as a connection is possible between the remote viewfinder and the camera. There are plenty of aids to buy that help with follow-focus. Some so simple they fit around the lens barrel and provide a bar to aid fine adjustment to quite complex focus rings mounted on a rig that connect to the lens with gears or even wirelessly using motors to drive the lens. There are even very efficient systems that can track a moving subject fitted with an wireless tag and electronically adjust the lens as the system follows the subject around the scene. These take the human out of the focus process altogether however the cost of this system is going to be very high. If you still need the human touch on a budget, brush up on those follow-focus skills. All of these techniques are quite simple but they take some practice before they’re second-nature. To become proficient at follow-focus, there's no substitute for practice. Only by working at it can it be instinctive. It should be something you get so good at that you don’t have to think about it. There’s no doubt it’s tricky but once mastered it’s a very useful skill to have. Some folks are very good at this, having excellent hand-to-eye coordination, some aren’t so good. Even experts don't hit every one though, some shots you’ll miss because you just lose focus.